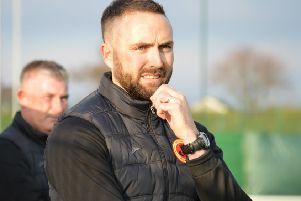 Rossvale’s misfortune in cups continued on Saturday when they lost out on penalties against their nine-man Premiership opponents Cambuslang Rangers. The Bishoppbriggs side took the West of Scotland Cup second round tie to a shootout when Chris Zok equalised from the penalty spot with five minutes to go. But it was the vsitors who prevailed to book their place in the last 16. Cambuslang probably just shaded the first half. They had the first serious attempt on goal on the 10-minute mark when a Darren Ramsay effort flew over the bar. Anton McDowell replied for Vale when his shot on target was put out for a corner. Rossvale then won a free-kick which Kirk Forbes blasted into the Cambuslang wall before David Leadbetter's excellent cross, after a break down the left, was met by Zok but his effort sailed over the bar. Cambuslang had to make a substitution when Callum McRobbie came on and his first touch was a hopeful long distance effort which was easily saved by Jamie Donnelly. The visitors suffered another blow five minutes from half-time as they were reduced to 10 men when Jamie Hay, already booked, was shown a second yellow card for another heavy tackle on Gary Giffin. Vale started the second half by moving the ball about well but every time Lang broke up the park they looked the more likely to score and the game raged from end to end. However Cambuslang really loked up against it when John Gemmell received a yellow and soon after a second, putting his team in a very unhealthy position. Vale manager Gordon Moffat made an immediate change, sending on another forward Andy Johnstone for defender Craig Buchanan, who had already been booked. But before the defence could settle McRobbie's cross found former Rob Roy man Chris Duff rising above everyone at the back post to send a looping header over Donnelly and put the nine men one up. It was a bit hard on Vale as they were well in the game at this stage and their frustration grew as, no matter what they did, the ball just wouldn’t go in. Zok was unlucky on three occasions with efforts which either hit the upright or went narrowly past. With ten minutes to go Stephen McGladrigan thought he had equalised only to see his header come back off the crossbar then Jamie Hunter had the same misfortune after great play between Zok and Gary McGrath. But with just five minutes to go Rossvale finally levelled. Liam McGonigle's effort was saved by Conor Cullen but in the aftermath Vale were awarded a penalty when the keeper lashed out and kicked McGonigle whilst on the ground and was lucky just to receive just a yellow. After a long delay Zok sent the keeper the wrong way to equalise. Rossvale piled the pressure in search of a winner, but it wasn't to be and the game went to a penalty decider which Cambuslang won 4-3.